The Tiger Lily, bears large, fiery orange flowers covered by spots. The name tiger probably refers to the spots on the petals. The flowers of this perennial can grow up to three inches in width. The Tiger Lily is also known as the Ditch Lily as it is found in and around ditches in large parts of America. This lily has a strong, sweet and distinctive smell. Besides producing a stunning spectacle, most parts of this plant are edible. There are two varieties of the Tiger Lily: The Oriental Variety, which propagates through bulbs that form at leaf axils; and the Common Wildflower Variety, which propagates by tuberous roots. 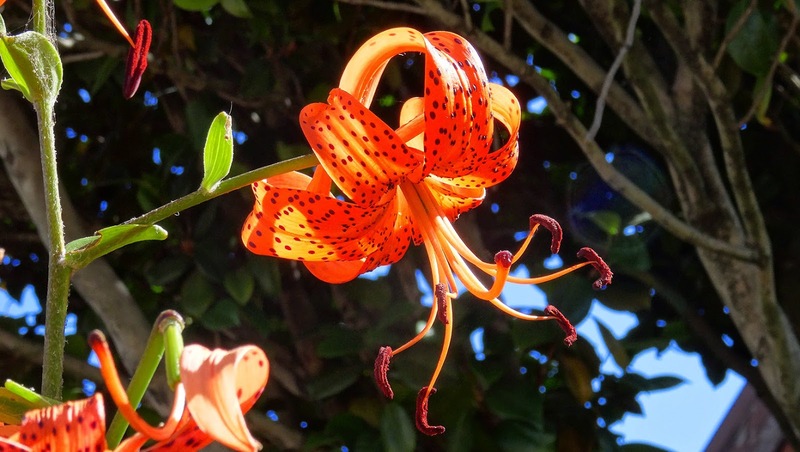 Due to its wild growing nature, the Tiger Lily is incredibly easy to grow. It thrives in moist to wet soils and hence grows well near ditches. Early to mid-autumn is the best time to plant out the bulbs in cool temperate areas, in warmer areas they can be planted out as late as late autumn. The Tiger Lily is sterile and does not produce seeds. It can, however, be propagated through the bulbils (small bulbs) that grow in the axils of the leaves. Bulb scales can be removed from the bulbils and grown in moist peat in a cool dark place until they produce bulbets. They can be then grown in a nursery and later planted outside. Rosa 'Kardinal' was raised by Kordes, Germany in 1985 and was originally produced for the cut-flower market. This rose does exceedingly well in the home garden and one bush will continually produce many perfect flowers. 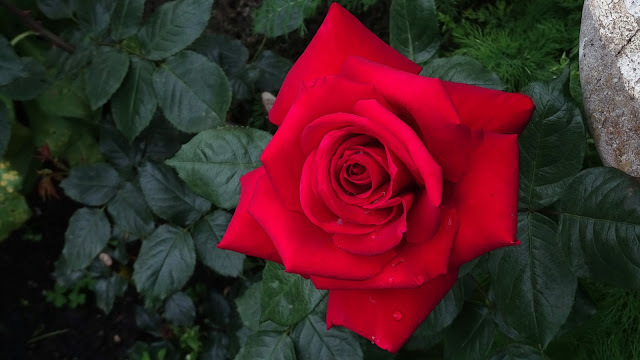 However, if three bushes are planted in a clump, gardeners would never have to purchase a red rose from the florist because this abundant flowering rose will generously provide bunches of vase quality roses throughout the season. Unfortunately, because of its perfect form, Kardinal invites you to take a sniff to enjoy the perfume – the disappointment of little or no fragrance lasts only moments because the flowers will endure in the vase for more than 10 days! The strong, long stems on this rose carry lots of prickles and there is usually one rose per stem which makes it easy to use a de-thorner. The foliage is semi-glossy, dark green and has good resistance to black-spot and mildew. If Kardinal is well nurtured, the flowers will be large and flower production will be immense in all weather conditions. PRUNE – During Winter, 70% of the rose plant should be pruned and all old wood removed back to the crown and the bush pruned to shape. During the flowering seasons, 25% of all flowering stems should be cut back after flowering to encourage strong re-growth. Papaver argemone is a species of the genus Papaver. 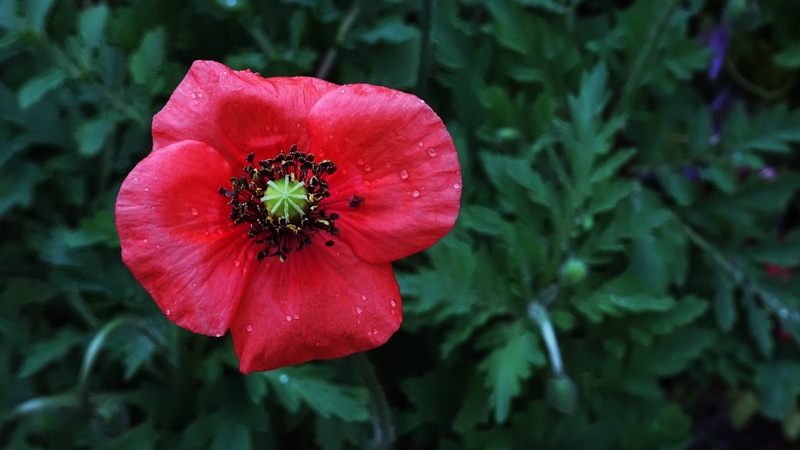 Its common names include long pricklyhead poppy, prickly poppy and pale poppy. Its native range includes parts of Eurasia and North Africa, and it is cultivated as an ornamental plant. It can be found growing wild in parts of North America, where it is an introduced species. This annual herb grows up to 50 cm, Its 15–50 cm long, branching stems are coated in stiff prickly hairs. The fern-like green, leaves at the base of the plant have stalks, but upper leaves are stalk-less. They can be up to 20 cm long. It blooms in spring to summer, between May and July. The flowers have four, slightly overlapping red petals, around a dark base. They can measure 2–5.5 cm across, with pale blue anthers and 4-6 stigmas. Later, the plant produces a seed capsule, oblong to clavate (clubbed like) shaped with ribs and up to 2 cm long. The plant contains alkaloids, explaining its traditional use in herbal medicines. It also means the plant is not eaten much by grazing animals. It is native to Europe and countries around the Mediterranean. It grows in fields and disturbed soils (including ploughed). It is normally found at 0–300 m above sea level. Serruria florida is a species of flowering plant in the family Proteaceae, endemic to South Africa. 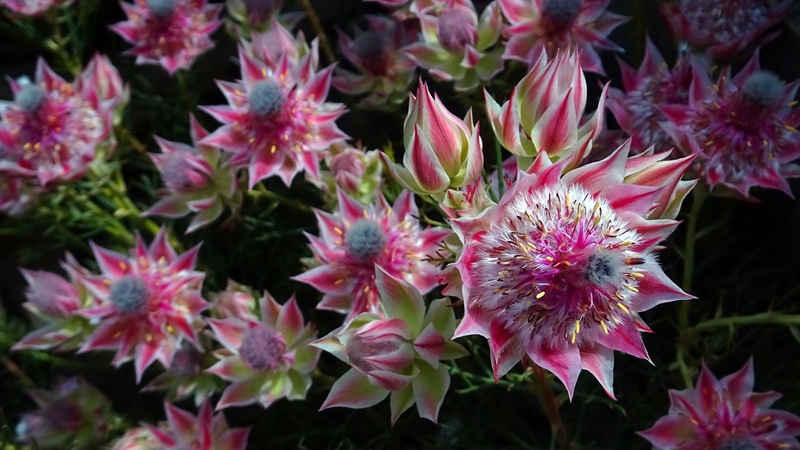 It is known by the common names of blushing bride or pride of Franschhoek. This species grows to between 0.8 and 1.5 metres in height and 0.5 metres in width. The leaves are fine and dissected and the flowers are white to pink and appear from July to October in its native range. It occurs in the Hottentots Holland Nature Reserve in the Cape Province. A well-drained position in full sun is preferred by this species, which tolerates dryness. Propagation is from cuttings or seed, although the latter can prove difficult. The species is cultivated for the cut flower trade and it is also grown as an ornamental plant.